Two years after the Summer of Love and life in the rural town of Pennsboro, Pennsylvania is about to explode. A dam that would flood the valley pits family against family. Protesters riot. Buildings burn. Amid the chaos of 1969, two lovers risk everything to fight for their dreams. 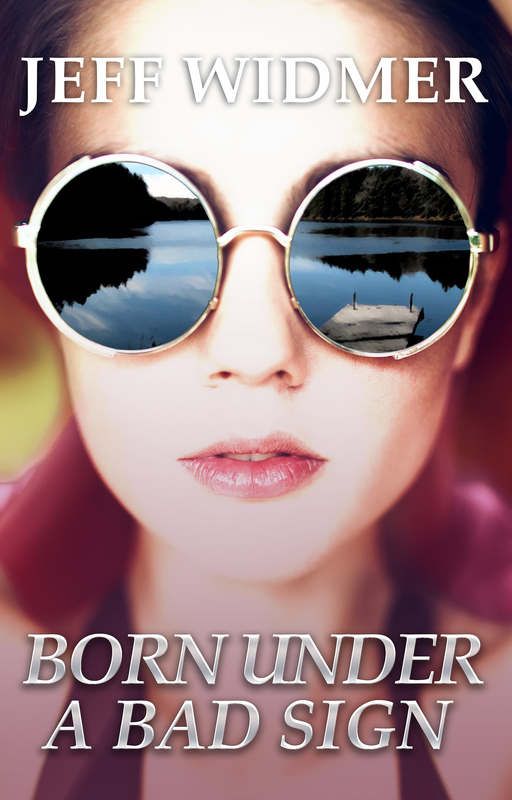 That turmoil forms the setting for my first standalone novel, Born Under a Bad Sign, a book that captures the spirit of the era through the eyes of an unlikely couple—a pacifist Quaker and a rebellious rocker, two people who wield their differences like armor and sword. Elizabeth Reed has three passions: photography, the river the government wants to dam and a musician who can’t settle on any one person or place. Hayden Quinn, the guitarist Rolling Stone calls the next Jimi Hendrix, feeds a single obsession—to play Woodstock, the biggest concert of his life. He presents Elizabeth with a dilemma: does she stay to save her family farm, or relinquish her dreams to follow Quinn into the unknown? In a time when her generation trusts no one under 30, Elizabeth must face the greatest risk of all—whether to trust herself. The story of Elizabeth and Quinn is inspired by real events. I grew up in Northeast Pennsylvania, the site of that proposed dam, and watched the conflict tear apart families and entire towns. Our band never would have made it to Woodstock but we opened for national acts and played some of the holes Quinn’s fictional group plays. And like Elizabeth, I wielded a camera for a small newspaper that covered the crises of the region, including the forced eviction of its citizens and the squatters who claimed their land. Coinciding with the 50th anniversary of Woodstock, the novel is a portrait of love and loss in the one of the most turbulent times in American history. 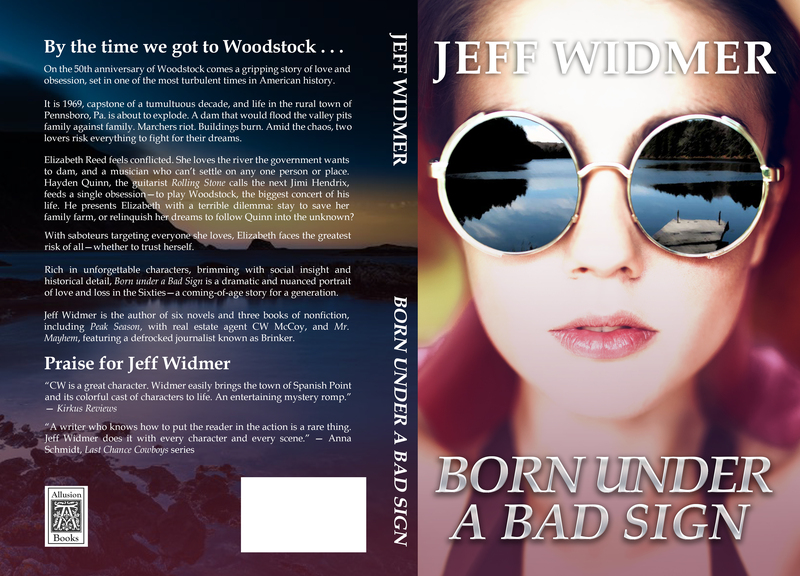 With an on-sale date of May 1, Born Under a Bad Sign is available for preorder through bookstores and online at Amazon, Apple Books, Barnes & Noble and Kobo. Coming May 1 to an online merchant and bookstore near you. Plan for the worst. Create two options, one for sheltering in place, the other for abandoning your home. Find a place to shelter before hurricane season. If you can’t stay with relatives or friends outside the disaster zone, investigate nearby motels and plug that contact information into your mobile phone. You can tough it out without hot food but not a shower: you don’t want to report for work with bat hair. Don’t assume your neighbors can shelter you. Chances are they won’t have electricity, either. Book lodgings at least two days before the storm hits or you’ll lose your place to other homeowners and utility crews. Everything runs on electricity, not just AC and the Internet. Even alternative-fuel systems with electric starters, like pellet stoves and some gas hot water heaters, won’t work. Credit card and ATM machines need power. So do gasoline pumps at service stations. Assume no one will have electricity, including the municipalities, and plan accordingly. That means bulking up on generators, manual appliances, and cash. Invest in battery backup. Power outages outlast computers, cell phones and smartphones. Consider universal power supplies and dedicated cell-phone chargers. Once a storm approaches, charge all devices every night you have power. And remember to check the batteries in flashlights. You don’t want to be one of the things that go bump in the night. Sign up for text alerts from the electric company so you’ll know when it restores power to your home. Create a neighborhood phone tree so when the electric company says it has restored power, you can verify, or challenge, that assessment. Store essential phone numbers on paper. Keep a copy in your house, car and pocket. Inventory your medications. Keep a list in your wallet or purse. As soon as the first storm forms, refill your prescriptions. Every time the weather service begins tracking a new storm, use those alerts as reminders to check your supply. Save plastic containers to fill with water for washing, drinking and flushing toilets. Fill your cars with gasoline as soon as the weather service says a storm will make landfall within a few days. Pack a crash bag and keep it in the trunk of your car. Include clothing, personal hygiene items, bottled water, flashlight, cell-phone chargers and over-the-counter and prescription medications. If you’re stranded on your way home, you’ll have a few essentials. Don’t overstock the refrigerator or freezer. Perishables perish. In addition to paper products and plastic utensils, stockpile liquids packaged in bricks, dry goods like pasta, peanut butter, bottled water, canned goods and a manual can opener. If there’s one lesson Hurricane Sandy has taught us it’s this: hope for the best but plan for the worst. Your future self will thank you. Learn about how to prepare for hurricanes from the Federal Emergency Management Agency’s Ready.gov site. With much of the Gulf of Mexico and the Eastern seaboard in the grip of hurricane season, residents might want to update their iPads with the latest weather apps. (The iPad doesn’t come with a basic weather app, unlike its smaller sibling, the iPhone.) Mashable’s Elizabeth Woodard has a few suggestions. For basic information in an uncluttered display, Magical Weather presents a week’s worth of temperatures in a transparent pane over an animated background. Users can swipe to retrieve an hourly forecast. For all the bells and whistles, Intellicast HD displays a full 10-day forecast with charts, graphs, sunrise and sunset times, moon phases, a radar picture, storm cell tracking, wind direction and a weather blog. For customizable graphs, Seasonality Go shows users a series of screens they populate with weather data. Users can move and resize the panes with forecasts and maps until they find the one they want. Some apps, like WeatherBug and The Weather Channel, are also available for iPhone and Android devices. Now if they’d only keep the roof from leaking. The shovel blade bites into the earth, black with rain and rot. It tangles with roots and rocks. The sun slants across the rising mound of dirt. Mosquitoes hover like angels of death. We wrap Jenna in her favorite towels that feature a smiling sun, a baseball team’s logo, a lobster at the beach. Lifting her from the carpet she seems heavy and stiff. I trudge up the hill, slipping in the mud. We bury her in a shallow grave, in this bowl-shaped depression at the edge of the woods, under the oak and pine, her head toward the east to meet the rising sun. Gently we cover her with topsoil, plant two trees at either end of the grave and cover the surface with mulch. I use a stone I unearthed to mark the spot. The rock is about a foot-and-a-half long. It points skyward like a crooked finger. She went this way, it says. A bear crosses the ridge this morning 50 feet from the house, a black hole of primal energy surfing the woods for the huckleberries that are beginning to ripen. We watch from the safety of glass as it passes and keep a weather eye on the dog, who sniffs the grass at the end of her lead, unaware of the animal. The bear is alone, no trailing cubs to spark an angry outburst, yet with its massive shoulders and haunch she is a force to avoid, like a tropical storm that could strengthen at any moment. It’s trash day in our neighborhood and we wonder if she’s hunting for the garbage cans that line the road. We’ll know in a few minutes when we slide into cars for the trek to work. She lumbers down the slope toward the neighbor’s screened porch, unaware of the watchers at the edge of the woods, her legs like two humans moving under a blanket, her pace as easy as sleep. It’s late, the dishes await.